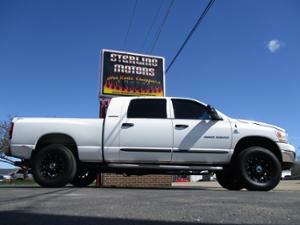 Description:Used 2006 Dodge Ram 2500 Extcab 4x4 Diesel Mega Cab for sale - $16,900.00 with 345,477 miles. 2006 Dodge Ram 2500 Mega Cab 4X4 Diesel Introduced in 2006, the Mega Cab boasts the most interior passenger space, cargo capacity and functionality as well as the largest flat floor load area of any pick-up cab ever produced. The Mega Cab's large interior can comfortably seat six adults plus their gear. This particular example is equipped with the Cummins 5.9L Diesel engine that was completely rebuilt just over 75,000 miles ago. During the rebuild it received ARP head bolts and 60 hp injectors. At the same time it was fitted with a new Industrial Injection turbo, a new water pump as well as a long list of parts from Gale Banks Engineering. The parts from Banks include the iQ dashboard pc, the Six-Gun diesel tuner, a Big Ram intake, an intercooler and performance headers. At the same time the engine was rebuilt it received a new transmission with a gear vendor overdrive, new Firestone rear shocks with air bags, new brake calipers, Power Stop brake pads, new slotted rotors, a new power steering box and a new heater core. You will also appreciate the Clarion touch-screen DVD player with Navigation and Bluetooth, upgraded speakers and amplifier as well as the stealth mounted K40 radar detector. The interior is in good shape and is fitted with a set of all-weather floor mats. We will be installing a new set of neoprene covers on the front seats but photographed them without covers to highlight the damage on the driver’s seat. The outside looks great with its tinted windows, its Extang tonneau cover, spray in bed liner and 18” XD rims wrapped in 35” (LT305/70R18) Nitto Dura Grappler’s. The truck is an absolute work horse capable of pulling its weight multiple times over. Not only that but it is more efficient and way more powerful than it was when new making it not only more efficient but a blast to drive. Everything is working as it should and it was recently serviced so it is in need of nothing but someone to put her to work. If you like what you see make a reasonable offer as we are serious about getting this one sold quickly! Description:Used 1994 Chevrolet Camaro Z28 for sale - $5,895.00 with 0 miles. 1994 Chevrolet Camaro Z28 1994 Chevrolet Camaro Z28 runs very good, auto trans. Fresh tune up. Needs nothing mechanically. Car was in storage for a few years before I got it. Needs minor TLC. Please Note The Following **Vehicle Location is at our clients home and Not In Cadillac, Michigan. **We do have a showroom with about 25 cars that is by appointment only **Please Call First and talk to one of our reps at 231-468-2809 EXT 1 ** FREE Consignment Visit Our Site Today Easy To List Your Vehicle and Get it Sold in Record Time. Description:Used 2000 Cadillac Deville Professional Hearse for sale - $8,395.00 with 0 miles. 2000 Cadillac Deville Professional Hearse 2000 Cadillac Deville Hearse. A beautiful Hearse by M&M. 96k miles. Looks good inside and out. Brand new tires! Please Note The Following **Vehicle Location is at our clients home and Not In Cadillac, Michigan. **We do have a showroom with about 25 cars that is by appointment only **Please Call First and talk to one of our reps at 231-468-2809 EXT 1 ** FREE Consignment Visit Our Site Today Easy To List Your Vehicle and Get it Sold in Record Time. Description:Used 2005 Cadillac Deville Professional Hearse for sale - $12,395.00 with 0 miles. 2005 Cadillac Deville Professional Hearse 2005 Cadillac Deville Professional Hearse.Super clean S&S Hearse with only 47k miles! This one won't last! It drives like a top! Sharp blue hearse! Please Note The Following **Vehicle Location is at our clients home and Not In Cadillac, Michigan. **We do have a showroom with about 25 cars that is by appointment only **Please Call First and talk to one of our reps at 231-468-2809 EXT 1 ** FREE Consignment Visit Our Site Today Easy To List Your Vehicle and Get it Sold in Record Time. Description:Used 2015 Chevrolet Corvette Zo6 Convertible for sale - $71,895.00 with 0 miles. 2015 Chevrolet Corvette Zo6 Convertible 2015 CHEVROLET CORVETTE Z06 CONVERTIBLE. THE CAR HAS ONLY 11250 MILES AND HAS BEEN GARAGE KEPT. THE EXTERIOR AND INTERIOR ARE FLAWLESS. WITH 650 HP THIS IS NOT FOR EVERYONE. THIS IS A HIGHLY ADVANCED MACHINE THAT HAS BEEN BUILT FOR SPEED AND COMFORT. THEIRS NOTHING LIKE THE HANDLING OF A Z06. THIS IS A BEAUTIFUL AUTOMOBILE IN EVERY SENSE OF THE WORD. Please Note The Following **Vehicle Location is at our clients home and Not In Cadillac, Michigan. **We do have a showroom with about 25 cars that is by appointment only **Please Call First and talk to one of our reps at 231-468-2809 EXT 1 ** FREE Consignment Visit Our Site Today Easy To List Your Vehicle and Get it Sold in Record Time. Description:Used 2013 Chevrolet Camaro for sale - $20,495.00 with 0 miles. 2013 Chevrolet Camaro 2013 CHEVROLET CAMARO LT. THIS IS A BEAUTIFUL CAR WITH ONLY 41K ON HER. THE EXTERIOR IS IN GREAT SHAPE WITH THE PAINT IN SHOWROOM CONDITION. THE INTERIOR IS ALSO IN PERFECT SHAPE SHOWING NO SIGNS OF WEAR. THE CAR HAS HEADS UP DISPLAY, ALLY WHEELS, AM/FM STEREO AND MUCH MORE. Please Note The Following **Vehicle Location is at our clients home and Not In Cadillac, Michigan. **We do have a showroom with about 25 cars that is by appointment only **Please Call First and talk to one of our reps at 231-468-2809 EXT 1 ** FREE Consignment Visit Our Site Today Easy To List Your Vehicle and Get it Sold in Record Time. Description:Used 2017 Jeep Renegade Trailhawk for sale - $19,888.00 with 46,679 miles. 2017 Jeep Renegade Trailhawk Clean CARFAX. Gray 14 4WD 2.4L I4 MultiAir ONE OWNER, iPhone Integration, Back up Camera, MP3, Prior rental, 115V Auxiliary Power Outlet, 4.334 Axle Ratio, 4 Wheel Disc Brakes, 6 Speakers, ABS brakes, Air Conditioning, Alloy wheels, AM FM radio SiriusXM, Anti whiplash front head restraints, Brake assist, Compass, Delay off headlights, Driver door bin, Driver vanity mirror, Dual front impact airbags, Dual front side impact airbags, Electronic Stability Control, Four wheel independent suspension, Front anti roll bar, Front Bucket Seats, Front Center Armrest, Front fog lights, Front reading lights, Fully automatic headlights, Heated door mirrors, Illuminated entry, Knee airbag, Leather Shift Knob, Leather steering wheel, Low tire pressure warning, Normal Duty Suspension, Occupant sensing airbag, Outside temperature display, Overhead airbag, Overhead console, Panic alarm, Passenger door bin, Passenger vanity mirror, Power door mirrors, Power steering, Power windows, Premium Cloth Low Back Bucket Seats, Radio data system, Radio Uconnect 3 w 5 Display, Rain sensing wipers, Rear anti roll bar, Rear window defroster, Rear window wiper, Remote keyless entry, Roof rack rails only, Speed control, Split folding rear seat, Spoiler, Steering wheel mounted audio controls, Tachometer, Telescoping steering wheel, Tilt steering wheel, Traction control, Trip computer, Turn signal indicator mirrors, Variably intermittent wipers, Voltmeter, ON LOT 4 8 19. 2017 Jeep Renegade Trailhawk PREVIOUS DAILY RENTAL 21 29 City Highway MPG br br 21 29 City Highway MPG br br Awards br 2017 KBB.com 10 Best All Wheel Drive Vehicles Under $25,000 2017 KBB.com 10 Coolest New Cars Under $18,000 2017 KBB.com 10 Most Awarded Brands br br If it doesn't say Fahrney on back of your plate, you paid too much! Included with all vehicles is a 6 month 6000 mile, 50 50 Limited Powertrain Warranty! |Excellent Selection of New, Certified Pre Owned and Used Vehicles, Financing Options, Serving Selma, Hanford, Visalia, Fresno, Sanger, Fowler, Lemoore, Kingsburg, Tulare, Clovis, Madera, Porterville, Dinuba, Caruthers, Fresno County, Kings County, Tulare County, Madera County. Description:Used 2018 Jeep Renegade Trailhawk for sale - $24,671.00 with 21,957 miles. 2018 Jeep Renegade Trailhawk Backed by a rigorous 125-point inspection by factory-trained technicians and an additional (up to) 100,000 mile warranty, this CERTIFIED PRE-OWNED VEHICLE offers the PEACE OF MIND you've been searching for. ... Wilde is your one-stop shop for new Chrysler, Jeep, Dodge, Ram and SRT sales, used and certified pre-owned vehicle sales, service and parts in Southeastern Wisconsin. We are fully-stocked with hundreds of cars, trucks, mini-vans and SUVs for every budget. CALL our knowledgeable staff at 262-544-5400, learn more about us and VIEW OUR ENTIRE INVENTORY online at www.wildedodge.com or VISIT us in person, conveniently located at 1710 Hwy 164 in Waukesha, WI. We look forward to serving you! It is the policy of this dealership that prices are plus tax, tag, title, and Dealer Service Fee of $219.00. All prices, specifications and availability subject to change without notice. Contact dealer for most current information. Dealer not responsible for misprints, omissions or typographical errors. Description:Used 2019 Maserati Levante Gransport for sale - $90,910.00 with 25 miles. 2019 Maserati Levante Gransport Blu Emozione Mica 2019 Maserati Levante GranSport Nerissimo Package AWD ZF 8-Speed Automatic 3.0L V6 4-Wheel Disc Brakes, ABS brakes, Adaptive suspension, Air Conditioning, AM/FM radio: SiriusXM, Anti-whiplash front head restraints, Auto High-beam Headlights, Auto-dimming door mirrors, Auto-dimming Rear-View mirror, Auto-leveling suspension, Automatic temperature control, Black Chrome & Dark Exhaust Tips Finishing, Black Color Door Handles, Black Front Grille, Black Window Surround, Blind spot sensor: warning, Body Color Lower Molding, Brake assist, Bumpers: body-color, Compass, Dark Taillamps, Delay-off headlights, Driver door bin, Driver vanity mirror, Dual front impact airbags, Dual front side impact airbags, Dual-Pane Panoramic Sunroof, Electronic Stability Control, Exterior Parking Camera Rear, Four wheel independent suspension, Front anti-roll bar, Front Bucket Seats, Front Center Armrest, Front dual zone A/C, Front fog lights, Front reading lights, FULL NATURAL DRILLED LEATHER, Garage door transmitter, Gloss Red Painted Brake Calipers, Heated door mirrors, Heated front seats, High Gloss Metal Net Trim, High intensity discharge headlights: Bi-Xenon, Illuminated entry, Kick Sensor for Hands-Free Tailgate, Leather Shift Knob, Leather steering wheel, Low tire pressure warning, Memory seat, Navigation System, Nerissimo GranSport Package, Occupant sensing airbag, Outside temperature display, Overhead airbag, Overhead console, Passenger door bin, Passenger vanity mirror, Piano Black Roof Rails, Power door mirrors, Power driver seat, Power Liftgate, Power moonroof, Power Bergen County's only Factory Authorized Maserati Dealership! Check out our February Lease specials, you're one click from driving away your new Maserati home! Description:Used 2016 Jeep Renegade Latitude for sale - $20,750.00 with 34,583 miles. 2016 Jeep Renegade Latitude Introducing the 2016 Jeep Renegade! It delivers style and power in a single package! Turbocharger technology provides forced air induction, enhancing performance while preserving fuel economy. With fewer than 35,000 miles on the odometer, this 4 door sport utility vehicle prioritizes comfort, safety and convenience. The following features are included: variably intermittent wipers, a roof rack, and power windows. It features four-wheel drive capabilities, a durable automatic transmission, and a 2.4 liter 4 cylinder engine. Our knowledgeable sales staff is available to answer any questions that you might have. They'll work with you to find the right vehicle at a price you can afford. We are here to help you. Description:Used 2018 Jeep Renegade Latitude for sale - Call with 5,778 miles. 2018 Jeep Renegade Latitude Clean Carfax One Owner 4x4 SUV with backup Camera! Description:Used 2015 Jeep Renegade sport for sale - $14,995.00 with 61,927 miles. 2015 Jeep Renegade sport This unit has a 2.4 liter 4 Cylinder Engine high output engine. The high efficiency automatic transmission shifts smoothly and allows you to relax while driving. This 2015 Jeep Renegade has four wheel drive capabilities. This unit is equipped with a gasoline engine. This unit demands attention with a bold yet refined yellow finish. Anti-lock brakes will help you stop in an emergency. Icebox AC keeps this vehicle cool all summer long. This unit features heated side mirrors keeping the ice off and your vision spot-on. This model is accented with a stylish rear spoiler. This vehicle is built for driving comfort with a telescoping wheel. Keep yourself cool in the summer with the premium quality tinted windows. You will have no problem towing your boat or trailer to your next outing with the Renegade. Description:Used 2016 Jeep Renegade sport for sale - $16,299.00 with 52,300 miles. 2016 Jeep Renegade sport CARFAX 1-Owner. Sport trim. JUST REPRICED FROM $16,995, EPA 29 MPG Hwy/21 MPG City! Turbo, ENGINE: 2.4L I4 MULTIAIR, 4x4, CD Player. AND MORE!======KEY FEATURES INCLUDE: 4x4, Turbocharged, iPod/MP3 Input, CD Player Rear Spoiler, MP3 Player, Child Safety Locks, Steering Wheel Controls, Electronic Stability Control. ======OPTION PACKAGES: POWER & AIR GROUP Air Conditioning, Power Heated Mirrors, Exterior Mirrors w/Heating Element, Speed Control, ENGINE: 2.4L I4 MULTIAIR 3.734 Axle Ratio, Engine Oil Cooler, UCONNECT 5.0 RADIO W/BACK-UP CAMERA 5.0 Touchscreen Display, GPS Antenna Input, Radio: Uconnect 5.0, Integrated Voice Command w/Bluetooth, ParkView Rear Back Up-Camera, 6 Speakers, SPORT APPEARANCE GROUP Black Side Roof Rails, Deep Tint Sunscreen Glass, Wheels: 16 x 6.5 Aluminum, PASSIVE ENTRY KEYLESS-GO PACKAGE Passive Entry/KEYLESS-GO, TRANSMISSION: 9-SPEED 948TE AUTOMATIC Vinyl Shift Knob. Jeep Sport with Alpine White exterior and Black interior features a 4 Cylinder Engine with 180 HP at 6400 RPM*. ======EXPERTS RAVE: Edmunds.com's review says The 2016 Jeep Renegade is a fine subcompact crossover SUV that has an abundance of character, is easy to drive and can surpass the competition when the road gets rocky.. Great Gas Mileage: 29 MPG Hwy. ======A GREAT VALUE: Was $16,995. ======BUY WITH CONFIDENCE: CARFAX 1-Owner ======VISIT US TODAY: Here at Honda Universe one of the NJ Honda dealers our mission is treat every visitor like an honored guest in our home but to the great Honda customers we serve it is much more than a mission statement. Our New Jersey Honda customers quickly learn that shopping at Honda Universe means being treated with respect Pricing analysis performed on 4/18/2019. Horsepower calculations based on trim engine configuration. Fuel economy calculations based on original manufacturer data for trim engine configuration. Please confirm the accuracy of the included equipment by calling us prior to purchase.